Coverage: Live commentary on BBC Radio 5 live and the BBC Sport website; daily highlights on BBC Two and online. Rory McIlroy says it would be “silly” for Europe’s Ryder Cup team to focus on one player when it comes to the threat posed by America’s Tiger Woods. Woods, who has won 14 majors, claimed a first win in five years at the Tour Championship in Atlanta last weekend. “I don’t want to speculate how he’s going to play or how he’s going to do,” said 29-year-old McIlroy. Woods was a wildcard pick of United States captain Jim Furyk, having shown a return to form following back surgery and personal problems. He is on the playing side for the first time since 2012, having been a vice-captain in 2016 and asked to do so again this year, but has only been part of one victorious Ryder Cup team from seven appearances. The 42-year-old has a record of 13 wins, 17 losses and three halves in the biennial competition, which is taking place at Le Golf National near Paris in France from 28-30 September. “This week he (Woods) is one of 12,” said McIlroy. 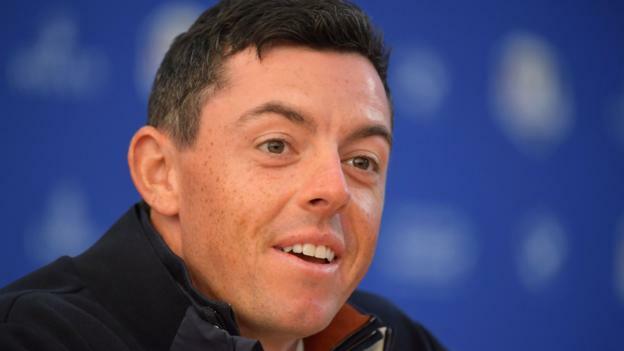 The US team won the Ryder Cup on home territory last time out and, as they bid to end a 25-year barren run on foreign soil, McIlroy believes there is more “togetherness” about them than in past tournaments. “The strength of Europe has been we all get behind one another – whatever differences we have we put them to the side for this week and we are a cohesive unit,” added McIlroy. “That has served us well for the Ryder Cups we’ve had success in. We’ve won a little more than we’ve lost in the last few years. “The American team is very strong and the dynamic has become a little more cohesive in the last few years and I think that is to do with the younger guys coming on board and embracing the Ryder Cup. Justin Rose goes into the Ryder Cup having become the first Englishman to secure the overall FedEx Cup, which determines the season-long PGA Tour champion, and netting $10m (£7.6m) as a result. “I’ve tried to curb the FedEx Cup. It finished for me on the plane over,” said the 38-year-old. “I’ve been playing consistently well, ultimately that’s how I won the FedEx Cup, and that gives me confidence coming into this week. “There will be moments when I can draw on that. Apparently all the team drinks are on my tab this week,” he laughed. There are five rookies in the European team, which is the same as in the defeat at Hazeltine last time out, but Rose believes it will help them being on more familiar territory. “I think it was a big disadvantage in 2016 but it is a big deal being a rookie playing away from home,” said Rose. Spain’s Sergio Garcia made Europe’s team as one of Thomas Bjorn’s captain’s picks but insists he does not have anything to prove going into his ninth Ryder Cup. “At the end of the day the captain’s picks are not easy but they know who they want to choose,” said the 2017 Masters champion. Garcia has dropped to 28th in the world rankings but has won 22.5 points in the Ryder Cup since making his debut as a teenager in 1999. Asked whether he had a special role to play this week, the 38-year-old added: “I think I do, from experience, from the way I am, the way I enjoy a team event, I think that is probably, to be totally honest, one of the reasons why they decided to have me on the team.